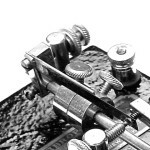 The Vibroplex Co. currently makes only one bug model, the Original, in several finishes. The company still makes a “Presentation” version, but it lacks the adjustable mainspring made it a separate model. 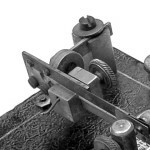 In the past, Vibroplex made as many as six models at one time (just after WWI), and most models were made in several varieties, with different base finishes and sometimes slightly different components. 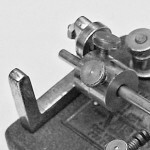 This page is intended to help Vibroplex owners identify their bug. If the serial number of your bug is between about 175,000 and 275,000, it’s easy to tell which model you have — just turn it over. The model name should be stamped on the underside of the base. 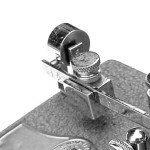 Three models are particularly distinctive — the Upright, Midget, and Double Lever. If your bug stands up on a U-shaped base, it’s an Upright, and you’re the lucky owner of the most collectable (but not the scarcest) Vibroplex. The Upright has a damper shaped like a “U”, either formed from two posts as part of the casting or a separate U-shaped piece milled from metal. 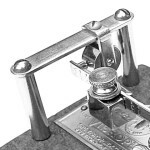 If your bug has a thin nickel-plated base, an outrigger leg, and a damper that’s simply a vertical peg, you have a Midget, also very scarce and collectable. A drawing of a Midget with a U-shaped damper was shown in advertisements but may never have been produced. Finally, if your bug has two separate levers, each with its own paddle (or knob), it’s a Double Lever, a hard-to-find model. If your Vibroplex doesn’t have the name stamped underneath and isn’t one of the three above models, first measure the width of the base. It will be 2.5″, 3″ or 3.5″ wide. Next, look in the table below for a damper assembly like the one on your Vibroplex. An “L” damper is made from two cast pieces. The lower piece is shaped like the letter L. The upper cast piece is hinged to it and supports a damper wheel. 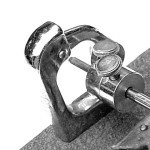 A “U” damper is simply a casting in the shape of the letter U with a damper wheel attached to one side. A “T” damper consists of a vertical post with a horizontal arm through it. The damper wheel is mounted to the end of the arm. The “M” damper consists of a damper wheel hanging from a flat horizontal bar between two posts. The result is an assembly that looks like the letter M.
An “I” damper has a U-shaped piece of bent metal that holds up the damper wheel. The result is an assembly that looks like the letter I. A "Simple" damper is one without the loosely-mounted wheel. Finally, this table will tell you which model you have. To confirm the identification, go to the Models page and click on the image. You should see an image of a bug like yours.